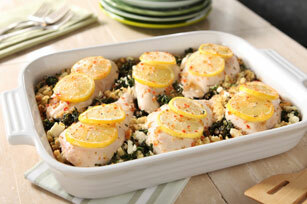 This spinach and feta chicken casserole is so simple to make—and quick, too. You can prep it in about 10 minutes; the rest is bake time. Add water to stuffing mix; stir just until moistened. Spread onto bottom of 13x9-inch baking dish sprayed with cooking spray. Bake 30 to 35 min. or until chicken is done (165°F). If the chicken breasts in your market are larger than 1/4 lb/115 g each, they will take longer to cook. Be sure to cook them long enough so that they are no longer pink in the centres and the juices run clear (165°F). Always wash hands, preparation surfaces and utensils in hot, soapy water before and after contact with raw chicken. Dry hands and surfaces with a clean towel or paper towels. Take special care in washing worn cutting boards as there may be hard-to-clean grooves or cracks that can collect bacteria.